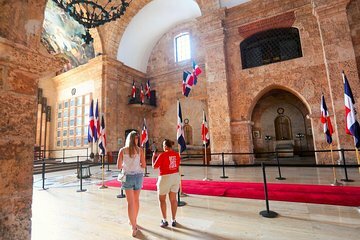 Passeggia per le strade più antiche delle Americhe in questo tour completo di Santo Domingo, con trasporto andata e ritorno da Punta Cana. Intraprendi un tour a piedi nella zona coloniale con una guida, un piacere per gli appassionati di storia, quindi visita il Parco Nazionale dei Tre Occhi (Tres Ojos) e il Faro di Colombo. Il pick-up e il drop-off in hotel a Punta Cana e un tipico pranzo domenicano servito a mezzogiorno rendono questa esperienza all-inclusive. The tour was good . The guide and driver were also very good and informative . A lot of history about Columbus. The lunch buffet was very good. The only problem was being crammed into a small bus for 2 1/2 hours each way sitting on a jump seat with no back rest. Also the bus held aprox 24 people and only 3 spoke English. English speaking people got part of the conversation - 30%.